In this story, I speculated on how an alien species with a very limited frequency range of hearing would communicate. In thinking about the story, I wondered if a musical scale could be made where a western-music whole tone (like c to d) was divided into eight micro-tonal divisions—and if music composed for same could sound like music. I jiggered my software music synthesizer for such a scale and first tried playing simple pieces (like 'Twinkle, Twinkle Little Star) on it. They sounded horrible. Then, I tried actually composing from scratch for my microtonal scale. After playing back the 'music' a (large) number of times, it actually did begin to sound like music. And when, afterwards, I listened to 'real' music, the 'real' music sounded flamboyant, undisciplined, and somewhat unpleasant. I sent an MP3 of my microtonal stuff to Stan Schmidt, the editor of Analog. He is, in addition to being a fine editor, also an accomplished classical trumpet player and composer. Dr. Schmidt concurred that after listening a number of times, it did sound musical. He assumed I had a story to follow. And I did. The story appeared in Analog's April 2010 issue. In an 'it seemed to be a good idea at the time' moment some years ago, I got the notion to convert some of the fruit fly genome to music. There's even a somewhat compelling method to do it (described in my website www.darkzoo.net, where you can also hear the music). I wrote a computer program to do the translation and fed the output into a software music synthesizer (which I also created). I really liked the result which was 'untouched by human hands'. I called the piece 'The Little March of the Fruit Flies'. 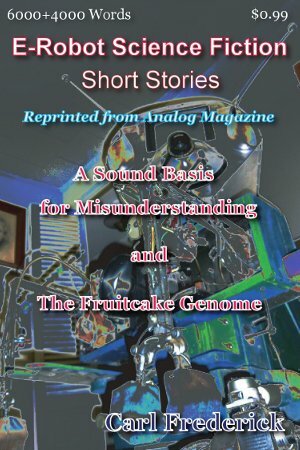 I wrote a short story based on the idea and sent it along with the music to Analog SF magazine. The editor bought the story and put the music up on the magazine's website—where the traffic of people downloading the music crashed the site. The story appeared in Analog in 2004. The music is still accessible on the Analog website www.analogsf.com (in the 'Science Behind the Story' section). You can also find it on my website, www.frithrik.com.